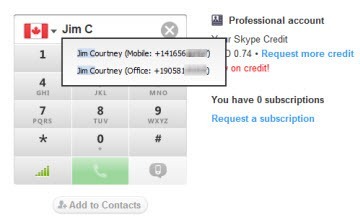 Interacting with the PSTN will often require the use of the Dial Pad available in the Skype client for situations where “touch tones” are used on a legacy phoneset. But Skype for Windows 5.x or later has some unique features that make it an “intelligent” dial pad for placing calls to the PSTN. 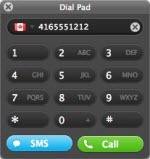 While Skype for Mac has a Dial Pad available it offers little more than the dial pad on a legacy touch tone phone set. There are two scenarios for using a Dial Pad in Skype for Windows; one when using Skype for Mac. 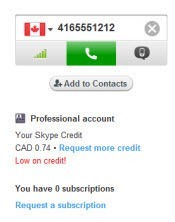 (Skype Contacts) If the Contact is already in your list of contacts and either (i) the Contact has entered his/her PSTN number(s) into their Skype profile or (ii) you have manually added PSTN number(s) to the Contact’s profile in your Skype client. Find the Contact in the Contact pane; the Call Bar in the Conversation pane will show a Call Button with a drop down menu. Click on the Dropdown arrow, select the number you wish to call and click on it to initiate a call. (Skype 5.5 Gold Release only) If you have selected a Facebook Contact, only PSTN numbers will show up (“Call Skype” will be missing). Simply widen or narrow the Skype client window to switch between the views. “Text Tone” dialling: start to enter the Contact’s name and a menu listing the Contact’s PSTN numbers will appear. Text Tone dialling: start to enter the Contact’s name and (as shown) a menu listing the various PSTN numbers associated with the Contact will appear. More on Text Tone dialling in Skype for Windows 5.2: Subtle Window Dressings II–“Text Tone” Dialing. During a call you may need to use a dial pad to interact with either an auto attendant to dial an extension or with an IVR to drill down through its menu to the desired objective of your call. In this case select the dial pad icon from the Call Control Bar and either click on the digits or enter the required digits from your keyboard. Normally a Skype-to-Skype call will not show the Dial Pad in the Call Control Bar. However, there is one case where Skype-to-Skype calls may require the dial pad. This involves calls placed from either a Skype client or a Click-to-Call button to a Skype Connect-enabled PBX which has been configured with a multi-user business Skype account. In this case, place the call as described above to the PBX, effectively to the business account’s SkypeID. If it is answered by an Auto Attendant or IVR, select “Show Dial Pad” in the “Call” dropdown menu; an additional dial pad icon will appear in the Call Control Bar and the dial pad will appear. You can then enter the extension from the keyboard or by clicking on the dial pad buttons. Again for calls to the PSTN, simply bring up the dial pad by clicking on “Window | Dial Pad” in the Skype menu bar. The Dial Pad will appear as a separate window. In this case the window is available either to manually enter a phone number via the keyboard or mouse clicks when not in a call or to dial an extension or respond to an IVR during a call. If you start to enter a number, a drop down menu, showing numbers from previous calls to the PSTN containing the same digits entered, will appear. None of the other options available in Skype for Windows is available in the Skype for Mac Dial Pad. Of course, another option for calls to the PSTN is to select a Contact and, using the drop down menu from the Call button for the Contact, place calls to a PSTN number that has been entered into the Contact’s profile.